Aggressive fibromatosis is a mesenchymal neoplasm associated with mutations resulting in β-catenin mediated transcriptional activation. Plasminogen activator inhibitor-1 (PAI-1) is expressed at a high level in aggressive fibromatosis, and using transgenic mice, we found that PAI-1 plays an important role in aggressive fibromatosis tumor formation. Familial adenomatous polyposis is associated with Adenomatous Polyposis Coli gene mutations resulting in β-catenin mediated transcriptional activation, yet only some patients develop aggressive fibromatosis. 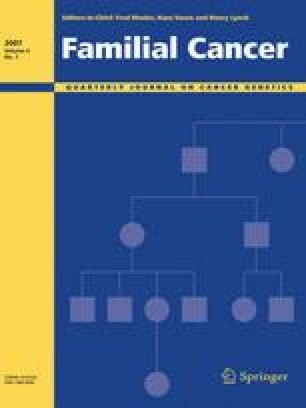 Since PAI-1 expression is influenced by a promoter 4G/5G polymorphism, we investigated the incidence of this polymorphism in familial adenomatous polyposis patients who did and who did not develop aggressive fibromatosis, as well as sporadic aggressive fibromatosis patients. There was a trend towards association of the 4G allele (associated with high PAI-1 expression) with the development of aggressive fibromatosis in familial adenomatous polyposis patients (50% vs. 19%, P = 0.1). In familial adenomatous polyposis patients who did not develop aggressive fibromatosis, there was a significantly lower proportion of patients with a 4G allele compared to the healthy control (19% vs. 51%, P = 0.0286). The lower incidence of 4G polymorphism in the PAI-1 promoter may be preventive against the development of aggressive fibromatosis. This data provides additional evidence supporting an important role for PAI-1 in the pathogenesis of aggressive fibromatosis. The healthy control genomic DNA samples were kindly supplied by Dr. Steven Gallinger, Samuel Lunenfeld Research Institute, Toronto, Ontario, Canada. Derek Stephens provided assistance in the statistical analysis of our data. Thanks also go to members of sequencing facility at The Hospital for Sick Children, University of Toronto for sequencing the PCR products to verify the genotype of the samples. This study was funded by Grants from the National Cancer Institute of Canada to BAA and BAA is supported by the Canadian Research Chairs Program. CFL is a recipient of Ontario Graduate Scholarship.